A fortune cookie is a thin wafer cookie that's crispy and slightly sweet. They're typically complimentary when you eat a Chinese restaurant or order Chinese takeout. The edible portion of one fortune cookie contains about 30 calories with 6.72 grams of carbohydrate with just .1 gram of fiber, .1 gram of protein, 3.63 grams of sugars, 22 milligrams of sodium and .22 gram of fat. One fortune cookie provides 1 milligram of calcium, 0.12 milligram of iron, 1 milligram of magnesium, 3 milligrams of phosphorus, 3 milligrams of potassium and .2 gram of selenium. A cookie also provides trace amounts of thiamin, niacin and folate. 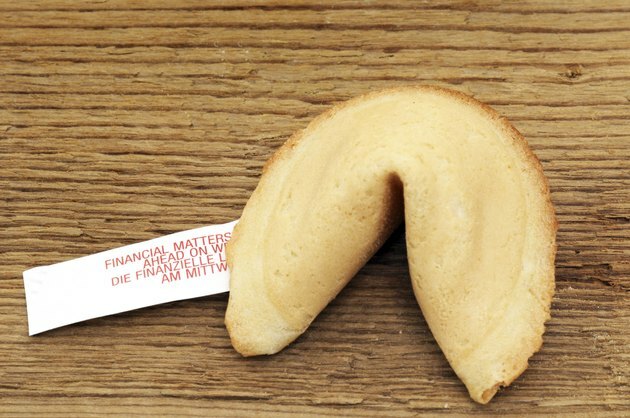 Fortune cookies typically contain flour, sugar, egg whites and oil. The cookie batter is thin and flattens when cooked. While warm, the cookies are molded around the slips of paper and allowed to cool and harden.